Matti Virtanen is trying to get his family back by buying a house. Marja is a blogger. Olavi is one of the richest men in the country. She might be able to save her blog if she dates him, but what if she falls for him for real? Finnish Continuation War rages and a platoon of soldiers is forced to face the horrors of the forefront. Based on Väinö Linna's book of the same name. Katri and Janne want to make a trip, which none of their friends have made. They end up in Jakomäki. There is civil war in Finland. Between whites vs reds. A woman soldier of reds is captured by the whites. She is ordered to be executed. 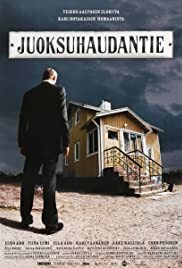 Juoksuhaudantie is a nice movie, though it is very close to the book written by Finnish author Kari Hotakainen. The book won the biggest Finnish literature prize, Finlandia, in 2002. Though book and movie are very similar, they contain also some differences. The book contains much more humor and is more optimistic too. The main problem on the film is that the highlights of the book, which are due to the verbal acrobacy of Hotakainen, are impossible to translate to a movie. And the makers of the film have not managed to invent many new points which would render the loss of Hotakainen's best verbal insights. Though the film has its weaknesses, it is very fluently directed and pleasant to watch. No matter have you read the book or not.